Trump hasn’t yet authorized a cent of spending on the military. Trump wants us to think he’s already expanding the military. That makes no sense. 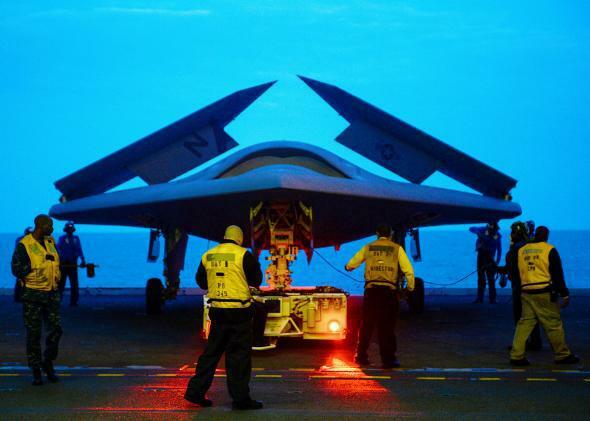 An X-47B is towed into the hangar bay of the aircraft carrier USS George H.W. Bush in 2013 in the Atlantic Ocean. If Trump is implying that this buildup is the result of his choices and actions, the claim is not only false but impossible. The Trump administration has not yet spent an extra dime on defense, nor enlarged the military by a single man or woman in uniform, nor expanded the arsenal by a single bullet. This is not meant as criticism. After all, Trump has been president for less than three months and has not yet submitted a defense budget. (He did say he would ask for a $54 billion increase in the defense budget, bringing the total to $669 billion, but a line-item breakdown isn’t due for another month or so.) Once he submits the complete document, it will have to go through four congressional committees, then a debate and vote in both chambers of Congress, then a settlement of the differences by a House-Senate conference committee. The Treasury Department won’t—and can’t—release any of the money until the start of next year. Once the money does begin to flow, it will take a long time to spend out. This is because weapons systems, especially large ones, take a long time to build. In a budget document known as the Green Book, prepared each year by the Pentagon’s comptroller, there is a chart labeled “Outlay Rates for Incremental Changes in Budget Authority Purchases.” Budget authority is the money that Congress authorizes in a given year’s budget. Outlays are the amount that actually gets spent. Outlay rates indicate the amount that gets spent in the course of that year and subsequent years. For instance, a new Navy ship costs anywhere from $1 billion to $5 billion. But typically only 8 percent of that sum gets spent in the first year, 24 percent is spent in the second year, 20 percent in the third year, and so on, for anywhere between five and 10 years, depending on the type of ship. For Air Force planes, only about 6 percent gets spent in the first year, and the typical plane takes four years to complete. Even the budget for something as comparatively simple as Army missiles takes three or four years to spend out. In other words, whatever Trump and Secretary of Defense James Mattis decide to do with their maiden military budget, it will take years—probably as long as Trump’s first term—before they make a dent on the military’s size, shape, and strength. The money that the Defense Department is now spending on weapons procurement, research and development, personnel, operations, maintenance, and so forth all stems from budgets approved during Barack Obama’s years as president—which saw the highest defense budgets since the peak of Ronald Reagan’s Cold War buildup. Nor has Trump made the slightest impact on the officers running the military. He often refers to “my generals” and “my military,” and he is the commander in chief of the U.S. armed forces. But he has not yet nominated a single military commander. The current chairman of the Joint Chiefs of Staff, the chiefs of the military services (Army, Navy, Air Force, Coast Guard, and National Guard), and the heads of the military’s nine unified combatant commands (Central Command, Europe Command, Pacific Command, and so forth) were all put in place by President Obama. Franken describes Wolfowitz’s retort “kidding on the square,” defined as “kidding but also really meaning it.” But Franken was right: Bush went to war in Iraq with weapons and technology that Clinton had bought (and, though Franken didn’t say so, some of them had been developed earlier still). Nothing that the American troops carried into battle was invented by, or during, the Bush administration—which, at the time of the Iraq invasion, had been in office for a little more than two years. The notion that, today, the U.S. military is “becoming rapidly stronger,” as a result of Trump’s first three months in office, is risible.